and when you're ready, just toss them in the laundry without worrying they'll get lost in the mix! 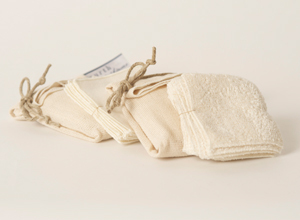 Terry comes in set of 6 with organic washbag. These nubby squares are great for exfoliating and removing masks. Flannel comes in set of 10 with organic washbag. These super soft squares are ideal for delicate skin types. for easy drying, you'll love the convenience of these versatile mitts! favorite chemical free detergent for those of you with sensitive skin. of Onurth's Facial Masks. Both types are essential for all your skin's needs!